As you all know that I live in the Bay Area, which is known and praised itself on culinary diversities. As much as I don’t want to admit, there is not much to offer on macarons! How sad! So when I discovered macarons in jewel like colors in the displaying domes of the Dean & Deluca café window at the SoHo location, I had my mouth open in awe. Simply exquisite! Sheepishly, I bought one in every flavor and took my time savoring them; each bite filled me with this fuzzy happiness ~___~ That was my 1st encounter with macaron! 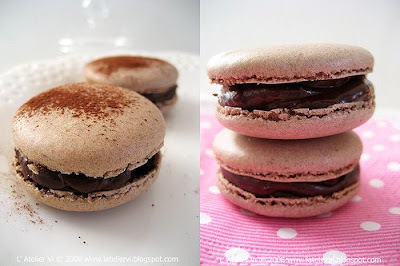 Then seeing so many blogs and books presenting gorgeous pictures of these popular mini-hamburger look alike little fellas (over and over again), I have an urge to try my hand on macarons. How can I resist?! They are just sooooooo cute! Judging from the vast number of patisseries with macaron-clad window in Paris, I think no one would doubt that macarons are in vogue and crazy popular over there. In recent years, macarons are gaining popularity at lightning speed through out the rest of the world too. Among all Parisian macarons, Pierre Hermé’s macarons are said to be the most lust after especially the ispahan (rose-litchi-raspberry) macaron, and also for his dozens of exciting flavors such as the combinations of chocolate and fleur du sel - caramel, pistachio and apricot praline, and chestnut and green tea. Many believed that PH has single handedly revolutionized and elevated macarons to a whole new level, and started a macaron cult according to macaron fanatics. So what is macaron (sometime they spelled macaroon and no, it is not that coconut cookie!) and why are people so crazy about it? Well, it is a traditional French pastry. The original macarons were made of egg whites, almond powder, icing sugar, sugar, with no special flavors and no filling. Nowadays, the flavors and texture are limitless. 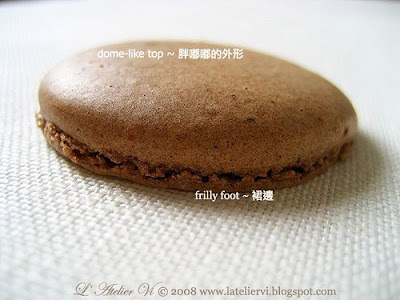 Macarons has a round meringue-like dome with a flat base, it has the little bubbly ruffle that forms around the base a.k.a the frilly “foot”, a crust that's thinner and more fragile than an egg shell, innards/center that are preternaturally light, and tooth-achingly sweet. They are often filled with buttercream, ganache, or a fruity filling of jam. Traditionally round but they also come in shapes like square, oval and heart shape. Crunchy yet chewy, and picture-perfect macarons are notoriously difficult to get was the conclusion I got after reading numerous horror tales from many fellow food bloggers. As stated by many, macarons are all about technique. Too airy, they dry out and crumble; too dense and they become tough and gluey; one extra fold, it's all over; not enough, you won't get that little foot, which is the characteristic of perfection! - First, sift the almond powder twice then add it to the powdered sugar and cocoa powder mix, and sift again. - Refrigerate the egg whites well and take it out only when called for. - On the back side of 2 parchment papers, trace 1 inch circles about 2 inches apart. Flip them over and line the baking sheets. - Preheat the oven to 440°F/220°C. - Fold with a light hand to prevent bursting the air bubbles. - Must let the piped cookies sit out for 10 minutes before baking. 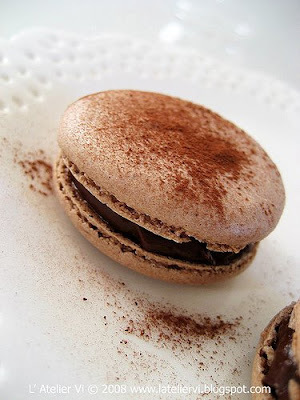 - Press the tip on the baking sheet and pipe for uniformly shaped macarons. Do not suspend the tip in the air. In a large dry bowl, whip the egg whites on medium speed until foamy and the color turns white. Gradually add the granulated sugar, increase the speed to high and continue to whip until stiff peaks form – the whites should be firm and shiny. With a rubber spatula, fold in half of the almond/sugar/cocoa mix into the egg whites until incorporated then add in the remaining mix, and fold until completely incorporated - the batter should be glossy. Fit a piping bag with a 3/8-inch round tip, or take a 12 inches plastic piping bag and snip off one corner. Fill the piping bag and pipe the batter from the center of the drawn circle onto the baking sheets. Pipe about 40 circles. Let dry at room temperature for 10 minutes before baking to allow skins to form. Bake for 6 minutes at 440°F/220°C, then turn it down to 260°F/130°C, continue to bake for 12 minutes. Remove macarons from oven and transfer to cool on the cooling rack. Once cooled, slide a knife underneath the macaron to remove from parchment paper. Place the finely chopped chocolate in a heatproof bowl then set aside. Bring the cream just to a boil in a saucepan over medium heat; remove from the heat. Slowly pour the hot cream to the chocolate, stir until smooth, add the rum, and stir until incorporated. Let cool to room temperature then refrigerate for 30 minutes. 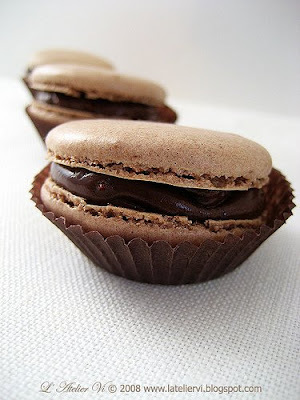 Pair macarons of similar size, pipe about 1 tsp of the filling onto one of the macarons then sandwich macarons. Let them set in room temperature or refrigerate to set. Make 20 sandwiches. 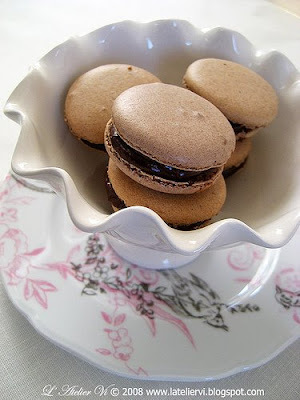 If refrigerate, bring macarons back to room temperature before serving. Hi, my name is April, I also live in the Bay Area. I have been reading your blog and surprisingly found you made macaron recently, which I have been planning to make for a long time. I absolutely adore your macarons, the pictures are just beautiful. I hope mine will come out like that too. But I still haven't found almond powder anywhere in San Francisco, do you mind telling me where you got yours? Thanks. It took me 3 tries to get macaron right. You're a genius! Oh MY!!! They look so goood!!!!! There are many things that I have not yet make. Macaron been on my list for the longest time and I finally did it and I'm glad that I did =)I got the almond powder/flour from Whole Food @ 4th & Folsom. It is by a brand called Bob's Red Mill; pretty pricy. Trader Joe's has something similar called almond meal. I'm looking forward to hear about your macaron experience. hehehe...help yourself and grab one! I'm warning you that you should stay away if you want to fit into your wedding dress! Oh no, I was just lucky that day -.-"
Yumi's debut is around the corner. Everyone is gaga over her. In fact, she is next to me and snacking on dogie donut that my brother bought her. Soooo spoil! Next time when you are in NY, make a stop at Financier (http://www.financierpastries.com/). Even though is not near tourist attractions (well, unless you are interested in the Stock Exchange), it's worth a trip for those who love pastry. Their macarons are awesome. Hi, Venus, nice to meet you too. Thanks for the info, I will try it and definitely let you know the results. Can't wait. By the way, I found the almond flour on amazon by the same brand, people said it's cheaper. But it is 4 pounds, so that's kinda too much. again, thanks for the info. I saw your strawberry cake. It is very cute^^ Welcome to the world of desserts/pastries! Some people sub half of the flour mix with almond flour when baking cookies and other goodies coz it delivers a more desirable (and healthy) result! So the 4 pounds would be more cost efficient for them. I think I need to buy from Amazon since I plan to make lots of macarons, opera cake, and etc. As long as you follow the recipe and the baking direction carefully, you will have success with it! Give it a try! As for the filling, the purpose of the rum is to give it a little kick. You can omit it and it won’t affect the taste too much. I've been seriously contemplating on getting a dog... VERY seriously... thinking about it. I think you should get Turbo a dog brother or sister^^ My whole family talks to Yumi like she is a human being and she thinks she is one too -.-'It gets a bit freaky at time. 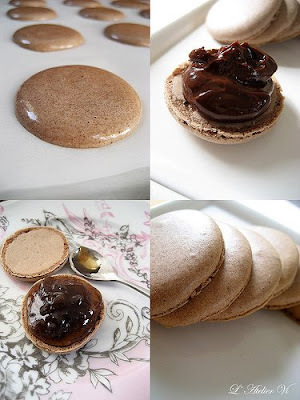 I made the chocolate macaron by your recipe... the macaron taste very good. Thanks for uploaded the recipe! I finally found a shop in HK can order PH Macaron cookbook...Happy Happy Happy! I was wondering have you ever bought a cook book called La Patisserie de Pierre Herme(French/English ver.)? Is it worth to purchase? Please let me know! Thanks much!